It can't be stressed enough, shoppers rush to the large item area. Though a large item might follow the “rule” of fitting on or under your table, it will often get more attention in the large item area. Check in at the registration desk before dropping off any items in the large item area. There you can pick up the slips for your items and small stickers to label each item with your table/row & item number as a point of reference. Fill out a tag for each item and securely attached. We will provide the tags and zip ties to attach to each item. CARSEATS must have at least one year left before they expire. If no expiration date is present the standard 6 year life span will be used to determine. 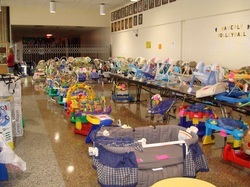 A car seat waiver for each seat must be filled out and submitted with inventory sheet. ***Travel systems with expired car seats are not permitted. You may sell the stroller, but the car seat should be destroyed*** Seats must have been manufactured in 2007 or sooner.